Like most people in America, I've recently found that I watch way too much television. Taking stock of what I watch, I've categorized the shows into a few groups. Here's a description of one of them. The one where we don't know whodunit and then watch the detective solve it. I call this second class "He's The Guy" mysteries, because careful viewers can pick up on telltale clues left by the production team. That guy you've never seen before but inexplicably has lines interacting with important characters? He's the guy. That teapot that the camera lingers on just a little too long in an establishing shot? It'll have fingerprints, and they'll prove that He's The Guy. I blame growing up with a MURDER SHE WROTE fan (that one based on Agatha Christie rather than Doyle) for my love of the 42 minute mystery, but I'm unsure why I â€“ and the rest of America â€“ gravitate toward preferring that their mysteries be solved by assholes. Maybe that says more about our culture than we'd like. 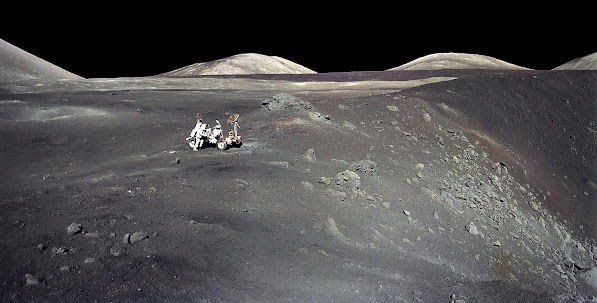 Today ï»¿on Google+, +Moon posted a really wonderful image of the lunar rover from the Apollo 17 mission, which had the effect of hundreds of amateur photo editors pointing out that the image is "fake." Mismatched shadows, bad coloring, etc. Standard fare. This resulted in tons of well-meaning people calling those people idiots. That resulted in other well-meaning people calling the idiot-callers idiots. Long story short: it's a panorama made up from multiple images. And the multiple images have all had their cross-hairs edited out to make it more attractive. And the color balances of many of the photos have been altered to make the panorama flow together more smoothly, and thus be more attractive. I downloaded that, and then checked it out in GIMP. Yup. Shadows are mysteriously inconsistent. There are some tell-tale edit points all over the image. So I then dragged that image into the search box on Google Image Search, and found some other copies of the photo, including higher-res versions. I downloaded those. Same story. I then did a 'similar images' search and found a couple interesting things. Cross-hairs are still intact in that one, and it shows quite a lot more of the moon's surface. Curious. 2) that the astronaut taking it was simply standing in one spot and rotating around taking photos. You'll notice that this is the portion of the picture showing the lunar module and astronaut, with cross-hairs intact. If you were so inclined, you could download all those images and run them through whatever panorama software you have lying around and could end up with exactly the same compositions. So, there you have it. 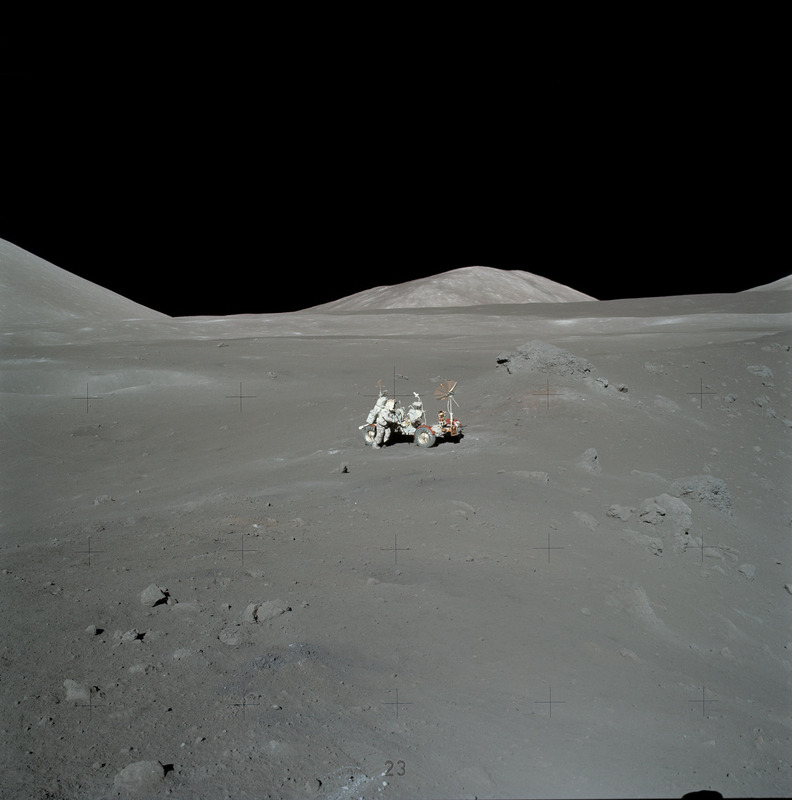 I have absolutely no doubt that the scenario described in the photo happened as NASA claims it did, but I have proven that the photo was very significantly edited in the process. Turns out that everyone was right. And it's everyone that is the idiot. A few days ago, a Google Blog post outlined some experimentation that Google did recently after discovering that some broken search results on Google were also showing up on Bing. The result? Google inserted some fake gibberish search queries in their database that return specific randomly chosen articles, some of which later returned the same result on Bing. Gibberish search queries that return the same random url on two different search engines seems to mean that one of them has to be looking at the results of the other. Bing says: 'Nuh uh. That is not the case. Oh, and also: Google makes billions promoting spam." OK, that's helpful. Later, in effort to address the bad PR resultant from the buzz around the issue, Bing responded making the claim that 'user data' is responsible for the common search results. The idea is that Bing promotes results that people are actually clicking on, and that the Bing Toolbar is doing some magicks to improve their search rankings. They say the reason that the gibberish queries show up in their results is just because Google engineers actually clicked the resultant links... and then the magick happened. A number of different factors are taken into account by the Bing Toolbar to influence how clicked links should affect Bing's search results, and apparently several of them only seem like they're just being copied directly from Google. That's fine, but if the gibberish search terms aren't present in the urls Google randomly selected for their tests -- and they're not -- the only way Bing would have any knowledge of the queries is if the Bing Toolbar is recording not only the click, but the Google search queries used to find that link in the first place. Bottom line: if Bing is populating their search database by indexing the results page a user got from doing a Google search, those results did in fact come "directly from Google" like Google claims. Whether or not there's anything wrong with collecting 'user data' about what information users search for (and find) on competing search engines is another issue entirely, but Google's claim here absolutely holds true. Bing is using Google's search results to affect the results they return when users search Bing. And they need to come out and say it rather than denying it and then trying to change the subject to Google's spam-promotion business model. That particular issue, however, is being completely overlooked by people who are now getting caught up in the 'OK, so what?' argument. This blog post (from a Microsoft employee) essentially says: "Google stole a bunch of features that Bing had; that's no different than Bing stealing Google's results. Since they're both stealing, it's ok." I say there's a big difference between copying UI features and copying actual content, especially when the only reason anyone uses your service is to access that content. It's not the same thing at all. In response to some of my Tweets, I've gotten links to a fairly well written article that purports to analyze the situation, which ultimately comes up with the same answer that the folks at Bing are saying: "they're not stealing from Google; it's just 'user data' responsible for the common search terms. Everybody does it. It's fine. Not stealing. Forget about it." At this point it's pretty clear to me that because of the missing-the-point pro-Microsoft 'analysis' bloggers are doing, people now think the following things: "this is some big Google VS Microsoft issue," "Microsoft is just being attacked by Google for a PR stunt," "Google is just a big meanie." Perhaps some (or all) of those things are true; even so, at the end of the day, the issue we're arguing is Google's claim that some of Bing's results are coming "directly from Google." That claim has been very effectively proven to be true. Yet Bing maintains that it's not -- and then talks about "making billions off of spam" to try to distract from the issue at hand. If Bing wants to make the case that collecting 'user data' from all of a user's activity, including the searching they do on competing search engines (and the results the searches returned) is what they want to do and are doing, then I'd be fine with that. But instead they're just saying it's not happening. And that Google is a spam whore. Google may be a spam whore, but everything they've said in the last few days regarding this issue is demonstrably true. Bing, on the other hand, has opted for Jedi hand-waves. I'll take an honest whore over an intellectually dishonest liar any day. Want to see pictures of a bunch of Android phones that aren't out yet? I've arrived safe and sound at the San Francisco Mariott Marquis, despite the city's valiant efforts to prevent my arrival by way of shifting one-way streets that've learned a trick or two from the Weeping Angels about reconfiguring when you look away. The San Francisco Mariott Marquis doesn't have free Wi-Fi -- but that's only a minor inconvenience because Droid Does. Not sure how well Verizon is going to handle providing my only Internet access for a few days, but I guess we'll find out. At least I'll be over at I/O mos of the time, and there's supposed to be real Wi-Fi there. Once I've relaxified a bit more I'm going to head over to the Marscipone Center to get my Google I/O registration stuff all taken care of before the rush, and I'll find out what the Wi-Fi situation will be. I'm off to lovely San Francisco to take part in Google I/O. I was going to use the latest in technological innovations to embed a Google Wave here into which I could post live updates, but I couldn't figure out how. Sorry. Anyway, i guess I'll be using Twitter / Buzz instead. Last month's Mobile Portland meeting featured a panel discussion speculating on the upsides and downsides of the newly announced Apple iPad. I was there, and was contacted by iPadInsider.com to write them a guest-blogger recap to run on their site. I agreed. It's now been a month and they've still not run it; the device may actually be available before they ever do. Assuming they do. With that in mind, I've decided to just run it here. I worked too hard on it to just waste it. The impending availability of the iPad has spawned a not-inconsiderable amount of excitement and speculation as to how we'll all be impacted by Apple's groundbreaking new device. In an attempt to address some of the speculation, February's Mobile Portland meeting gathered 5 experts from disparate fields -- fields that are pretty much universally expected to be significantly impacted by the iPad. Each expert took their turn speaking about their area of expertise for around 10 minutes, which was then followed by about half an hour of lively panel discussion fielding questions from the standing-room-only audience. "We don't know much; we don't have a ship date, we don't have a preorder date, and if you're outside the US, it's even worse." Among the interesting facts presented in Raven's talk was the impact that iPhone (and iPod Touch) have had on the mobile market. He said there are over 75 million devices in the hands of users -- about 50% iPhone, about 50% iPod Touch. He also said that iPod Touch has been rapidly gaining on iPhone, and that there are two massive growth periods each year: back-to-school and Christmas. iPod Touches are expected to overtake iPhones this year, as more and more are getting into the hands of young people. Young people came up several times throughout the evening, and it's clear that the appeal of Apple's devices will continue to stay strong as each new generation gains buying power. Up next was Jon Maroney from Handmark (http://twitter.com/jonm, http://www.handmark.com) who briefly addressed his recent experiences talking with publishers who are considering publishing on the iPad. "iPad is a safe place to try out new publishing models, and the publishers are looking to experiment. Apple says 'we are safe,' and they're listening." From what Jon had to say, publishers have already been trying to come up with new ways to deliver their products, and iPad promises to be a fairly win/win way to try out new methods. Jon also spends time talking with people in the "mobile" industry as well as the publishing industry, and shared an amusing anecdote about the lack of discussion about iPad at Mobile World Congress this year. "At MWC, not one person mentioned iPad. Then again, no one mentioned Palm, either, so I don't know if that really means anything." Next up was James Keller, also from Small Society, (http://twitter.com/semaphoria, http://smallsociety.com/) who ran through some of the exciting new user interface / user experience changes the iPad has innovated. Amusingly, pretty much everything she had to show us came from the handful of photos and youtube videos taken by journalists on the day of Steve's presentation, so there's still quite a lot of speculation as to how certain things work, or even what they're for. One of the things that most stood out was how Apple is now taking advantage of the larger display, creating sort of 'split-screen' areas for showing menus, options and additional content without having to obscure the content at which you're looking. Pretty neat stuff. "I sleep next to my iPhone. The last thing I do before sleep is check my iPhone. The first thing I do when I wake up is check my iPhone." James suggested that iPhone's impact her life could potentially be duplicated by the iPad as well. Whether iPad secures the coveted spot on James' night-stand is still up in the air, as well as just how useful it'll be as a device on which she can accomplish any work. One thing she's sure of, though: she can definitely see the appeal of iPad as a 'relaxation-time' device. "It's the perfect weekend device, even from the perspective of a power user. I'm likely not going to be wire-framing on it, but when I'm watching a movie and doing a crossword? Heck yeah." Then, coming back once again to the youth demographic, she pointed out what promises to be a pretty important demographic the iPad could potentially affect: students. "I think the iPad has a huge potential school appeal; I walked around with a back-ache for years at college, and the thought of having all my books and notepads on a small device is awesome." Chances are she's right; She can't be the only person sick of lugging books around. Someone in the audience suggested that he's heard that there are several pilot schools that are planning to issue an iPad to each student for that very reason. We've already seen schools requiring iPod Touches, so not only might not that be far from the truth, but it's also entirely possible that Apple could play a pretty huge part in the textbook industry in the near future if it's true. Chris Skaggs from Soma Games and Code-Monkeys (http://twitter.com/somagames, http://code-monkeys.com/ , http://somagames.com/) then talked a bit about exciting changes he foresees in both the web development and game development worlds because of devices like iPad. "What the web used to represent was this sort of, 'window' into a different world. But all of a sudden the iPhone started booming and it has allowed for interaction with sites in ways that are far less boring. You can do a lot more now than just look through that window." Chris talked about how having a device you can touch and pinch and rotate could make for really great interactive web experiences, as well as how iPad's always-on network connection and location-aware abilities could make for some really great gaming experiences. "The gaming thing is where I'm starting to get most excited about the iPad. People are starting to tie in location sensitivity -- like playing Marco Polo with your friends on your iPad at the mall, for instance." Chris also talked about the challenges of migrating from small-screen-based apps on the iPhone to the much larger resolution of iPad. He suggested that simply scaling up an app to fit the new resolution isn't enough, and that if a user is going to have a nice gorgeous screen, the developer needs to make their stuff look as good on it as possible. "When we started seeing the iPad, people started asking us what the gaming experience is going to be like. New display challenges, having so much more space, etc. The key will be: don't just blow it up, use the best of what you have." "The tablet takes cutting-edge PC technology and makes it available whenever you want it...It's a PC that is virtually without limits -- and within five years I predict it will be the most popular form of PC sold in America. -- Bill Gates in 2001"
Then Dave took some time to address the common complaints regarding Apple's locked-down platform, suggesting that perhaps their approach isn't doomed to failure because of its lack of openness after all. "Who will ultimately be successful may really come down to 'is the walled-garden approach better?' or perhaps 'is something a little bit more open the way to go?'" "How open does it need to be to be successful? How much does openness really affect the user experience of the people buying it?" "Who is the iPad built for? Who will buy it? I think fundamentally the answer is: 'not this crowd.'" "On the other hand, what you think you want, and what you actually want at the end of the day may be two different things." The murmur that went through the crowd after Dave said 'not this crowd,' really hit home that virtually everyone in the room was already thinking the same thing. Many people said it'd be great for their grandparents or their kids, but few present really seemed to be under the impression that iPad is really targeted to them. "When people go into an Apple store and touch one, it's going to be like 'oh my God, I have to have this,' and they'll have to then invent a justification to buy one." There were a lot of great quotes from the panelists at the meeting (many of which you can read on Google Buzz from Feb 22nd, complete with horribly inaccurate panelist names) but the one with the most crowd reaction came from an audience member whose name I didn't catch. "People are exhausted with multitasking. Even if it's just a magazine rack, you can really only look at one magazine at a time. Lack of multitasking on iPad is actually a plus." To a large extent he's wrong -- Jason Grigsby responded to this with the classic example of needing to add up some numbers on a webpage, for instance -- but his point does fall in line quite well with what Dave Shanley had to say about the limited functionality inherent in Apple's products, and how that approach may be the best way to serve a majority of their customers. The meeting concluded with a poll, during which somewhere around 90% of the people in attendance raised their hand to indicate that, based on everything discussed that evening, they fully intend to buy an iPad as soon as it's on sale. How we got from 'this device is not intended for anyone in this room' to 'pretty much everyone in this room is going to buy one' is a perplexing and amusing mystery, but there's no doubt that most will buy one. Just what they'll actually all do with them remains to be seen, however. We'll have to wait and see. Whatever it is they do with them, though, we can bet it will be cool. Remember that dancing Predator vid I re-edited to fit a new humorous soundtrack? Someone who saw it decided to try their hand at it as well. Predators dancing to funny music is now officially a meme! If you want to try your hand at it, an MP4 of the dancing predators can be acquired via YouTube. Here's the result, which I think you'll agree is a significant improvement.